Hello everyone, welcome back to my journal! Whether if you are new here or a regular, I am thankful for you lending your eyes to my work. The sun has been making his appearance more frequently (and finally) here in Montana and one of the best ways to take advantage of those rays is by literally drinking them via solar charged Sun Tea. Remember those ecentric yellow planters we used to plant some herbs on the last addition of my Reusable DIY Series with Guayaki? Well today I'm back with a quick and easy recipe using those fresh herbs and some Yerba Mate to drink up those sun rays with the power of Earth, Water, + Light. 1. 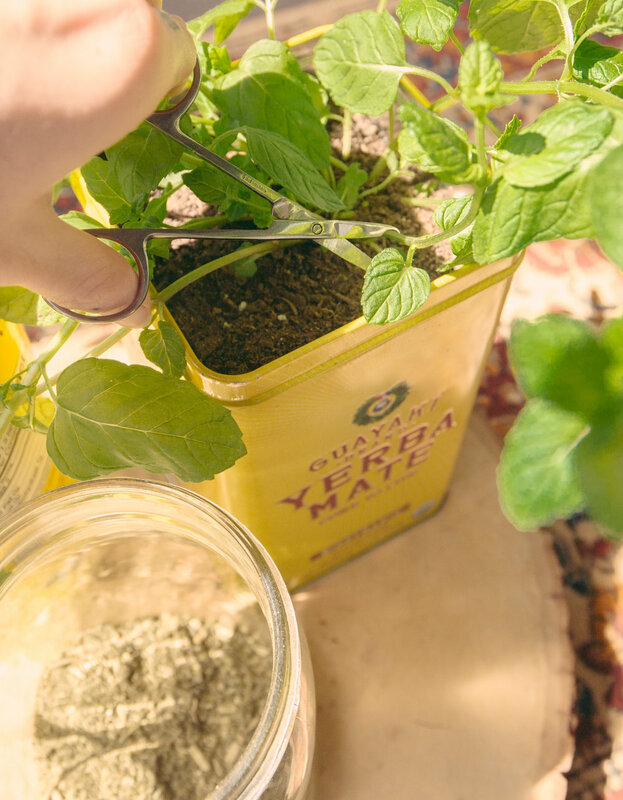 Fill your glass jar or container with a quarter of Guayaki Loose Leaf Yerba Mate, and fill the rest of the jar halfway with your fresh herbs. 2. Submerge all plant matter with purified water, give a quick shake or stir, and set in a window or outside to bask in the sun. Let brew for 4-6 hours in the sun's rays. 3. Once the concoction is brewed strain out all plant matter with a fine-mesh strainer and compost the waste. Put in the fridge to cool or serve on ice. You could also take it on the go by reusing your Guayaki Terere Glass Bottles! After straining use a funnel to fill up your reusable glass with your homemade Yerba Mate Herbal Sun Tea!